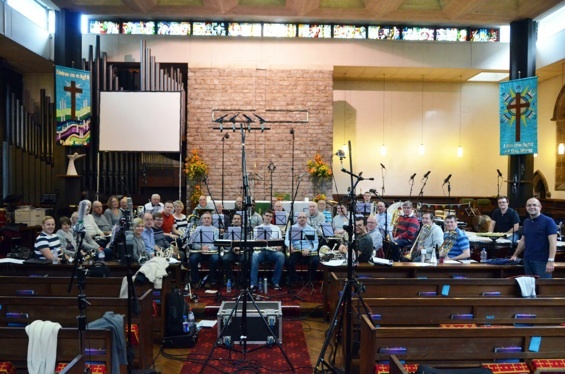 The Birmingham Citadel Band (Bandmaster Gavin Lamplough) had three recording sessions in two days, 10 – 11 October 2014, for a new recording with is due out in December 2014. This recording is a mix of old and new, as the band recorded established classic repertoire from Dean Goffin and Bramwell Coles alongside new music from the pens of Paul Sharman and Martin Cordner. Three solo items were recorded, a euphonium solo displaying the technical brilliance of principal euphonium David Taylor, a wonderful vehicle to display the lyricism and beautiful tone of principal tenor horn Neil Blessett and a relaxed Latin jazz arrangement by William Himes which gave Depury Bandmaster Mark Sharman the opportunity to shine and show his versatility. The band was delighted to record with Pure Technical Services (Sheffield) once again. It was a particular pleasure to have International Staff Band solo cornet, Regent Hall Deputy Bandmaster and prolific composer Paul Sharman assist with the production of this recording. 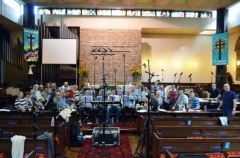 This article was posted in News and tagged Birmingham Citadel Band, David Taylor, Gavin Lamplough, Laura Sharman, Mark Sharman, Neil Blessett, Paul Sharman, recording session on 24 November 2014 .